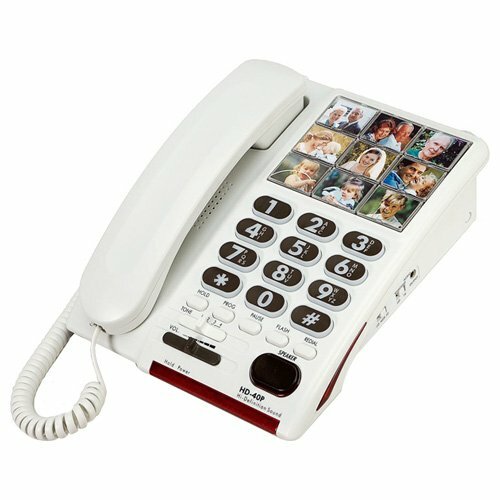 Designed for those with mild memory loss and/or hearing loss, the Serene HD-40P High Definition Amplified Photo Phone features an amplified speakerphone, nine large, one-touch photo memory buttons, and basic volume amplification up to 26dB. The phone also incorporates Digital Sound Processing technology that eliminates distortion, echo effects and unwanted static, resulting in crystal clear conversations. It even plays music when you place a caller on hold. The Photo Phone includes a 90dB super loud ringer with adjustable ringing volume and tone controls. Two ring flashers (front and side) provide visual call alerts for people with severe hearing loss. The handset is even hearing aid compatible to prevent interference and produce high-quality speech amplification for any user. The phone is powered by your telephone line, so no AC adapter is required. Personalize your Photo Phone to fit your individual hearing abilities by choosing from four digital tone settings. Each setting allows you to boost and enhance the specific speech frequencies you can't hear well, making difficult-to-hear words fully intelligible. 4 Tone Settings: 1) Amplifies low frequencies making lower pitched sounds easier to hear. This setting is for people with low frequency hearing loss. 2) Amplifies all sound frequencies equally making every word full volume and natural sounding. This is the standard setting. 3) Boosts middle to high frequencies making each word more intelligible. This is for people with mild high frequency hearing loss. 4) Amplifies high frequencies making high pitched sounds more distinguishable and easier to understand. This is for people with severe hearing loss and difficulty hearing high pitch sounds. CONTENTS: Phone base, Handset with hook, Phone cord, Telephone line cord, User manual. If you have any questions about this product by Serene Innovations, contact us by completing and submitting the form below. If you are looking for a specif part number, please include it with your message.